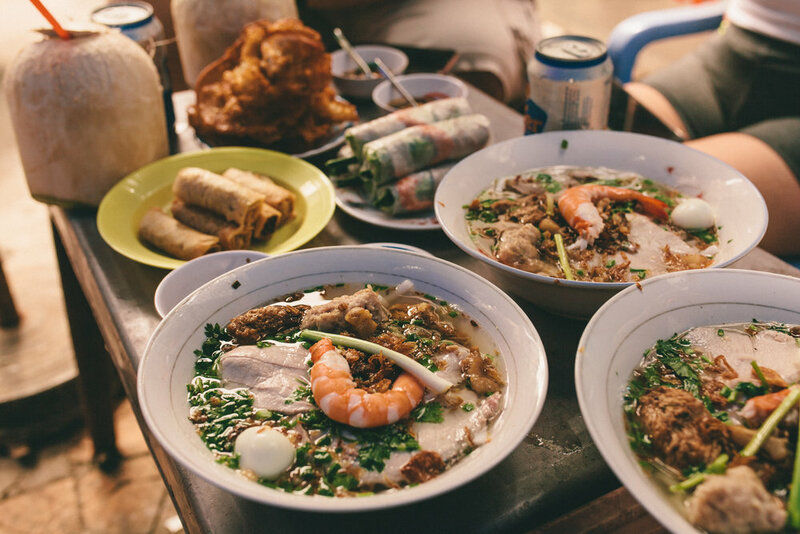 So you have 3 days in Vietnam and you want to to experience the best street cuisine. WHERE DO YOU BEGIN? Well here is a good start! I’ve been to Vietnam 5 times in the last 12 years and with every trip back home, it always dawns on me just how much Ho Chi Minh City is rapidly changing. High-end developments, luxury villas, exclusive shops and restaurants are taking shape all over town. One thing, however, that remains unwavering in a sea of advancement and progress is Vietnamese street food. But as the city evolves, it also flourishes. 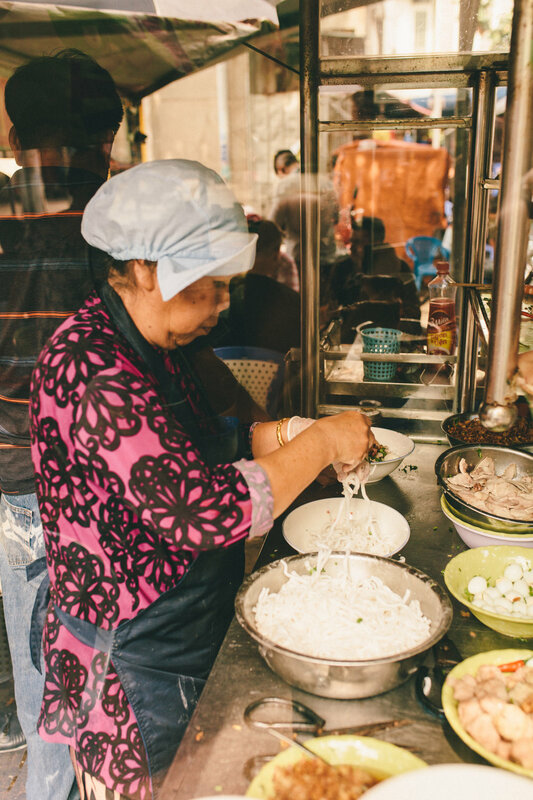 From sidewalk vendors to storefront restaurants, street food is part of the cultural fabric of Vietnam. It is so sought after that cities all over the western world are replicating the traditional culinary dishes. 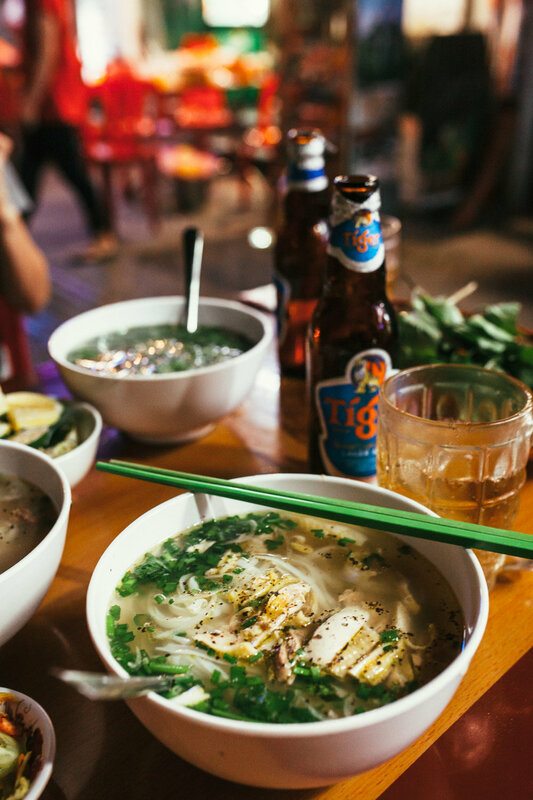 Having traveled throughout South East Asia quite frequently over the past few years, I can say that compared to its neighboring countries, you will never have a problem finding a good place to eat in Vietnam at any time of the day. Even at 4am when you’re jet-lagged and your hotel has stopped providing in-room dining service, you can surely find a makeshift pho stand around the block to satisfy that hangry belly. San Francisco, take notes! It’s not that I expect anyone to roll around food stalls in the dead of night on Market street slinging delicious bowls of pho, but having a decent Vietnamese restaurant open past 1am would be nice. That delivers. For free. Is that too much to ask? Now pull up a plastic chair and let’s dig into the good part! The Lunch Lady. Location: 23 Hoang Sa St.| Phuong Da Kao, District 1, HCMC, Vietnam. 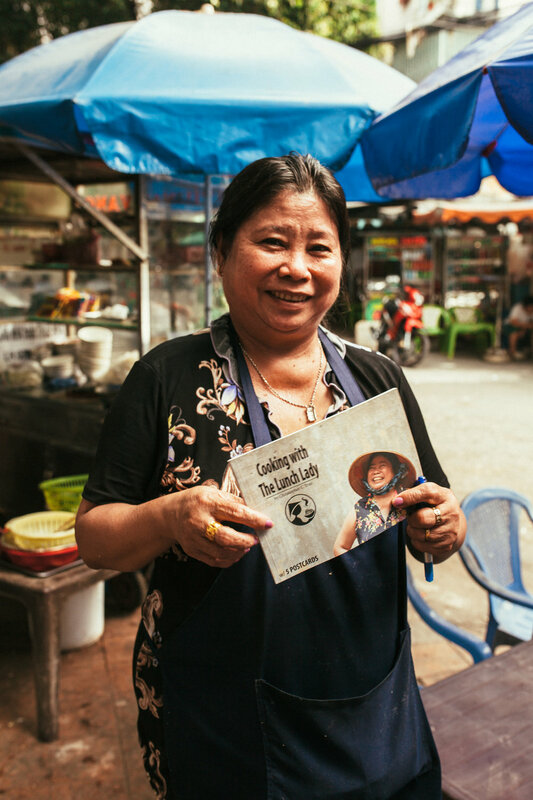 The Lunch Lady herself, Ms. Nguyen Thi Thanh. She also had other people help running her stall when she steps away. Our bowls of bun thai, accompanied by goi cuon (spring rolls), cha gio (egg rolls) and shrimp crackers. We also had 3 beers and 3 whole coconuts, thirsty much? Pho Ha. 19 Hai Trieu St, District 1, Ho Chi Minh City. How all pho ga (chicken pho) should be. Made Hanoi style, it is simple, clean and full of flavor. Known for their late night eats, Pho Ha ladle out one hell of a bowl of pho. It’s ultra-satisfying without the next morning guilt. 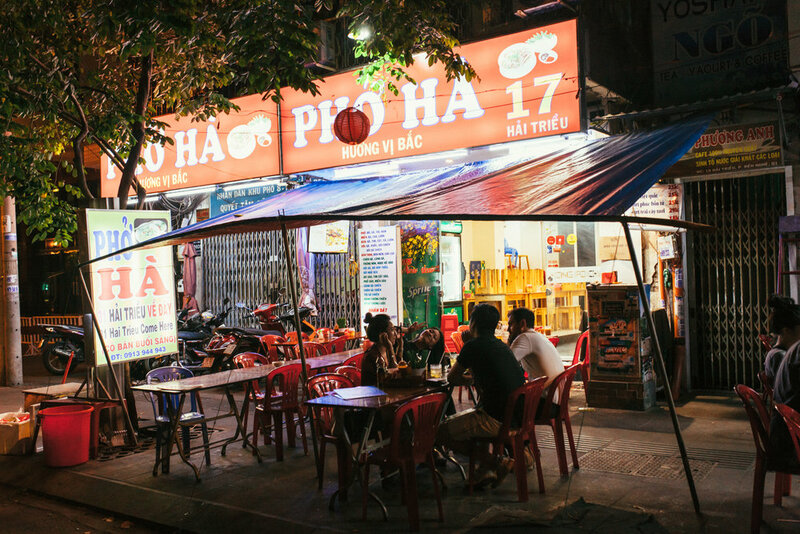 Most late-night restaurants in HCMC are open until 1am but very few open beyond those hours. Fortunately for us Pho Ha is open from 4pm to 5am! The staff is friendly, the service was quick and most importantly the quality of the food was great. It certainly met my expectations of a solid pho ga.
Oh you know.. just grilling the best pork chop in town, no big deal. Com Tam 74 menu as of January 2019. We ordered #1 on the menu with a few add ons; shredded pork, fried egg, pork pie and meatball. Also with a couple small side of winter melon and mushroom soup. Com tam translated in English simply means broken rice. It’s a traditional Vietnamese dish, regularly found in pho restaurants across the States, it’s usually served with a plethora of different toppings so you can have whichever combo that suits your liking. On our first full day in HCMC, we wanted to switch up our noodle soup meals for something more substantial so we decided upon com tam. 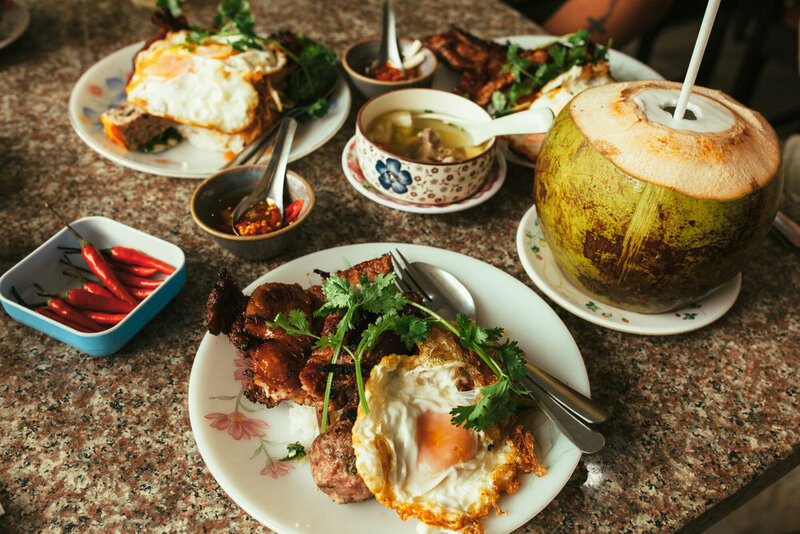 Highly recommend by a couple of friends, we stopped by Com Tam 74 for breakfast. We all pretty much had the same thing except maybe 1 different add -on. The food took unusually long before arriving, but it was well worth the wait, I mean…LOOK AT THAT EGG. It’s just sitting there looking all yolked with its over-easy self, perfectly crispy on the edges… true egg-cellence in all it’s glory. The highlight of the dish was definitely the pork chop (sorry egg), which was executed perfectly! Pork chop that’s served with com tam is usually thin cut and a lot of times can be on the dry side if not made right. Ours was tender and not to mention, exceedingly large. And the cherry on top? It was cooked on a charcoal grill which makes a world of a difference in terms of flavor. Obviously. So shout out to the man behind the grill! Beefsteak Nam Son. 200 Bis Nguyen Thi Minh Khai, Ward 6, District 3. HCMC, Vietnam. 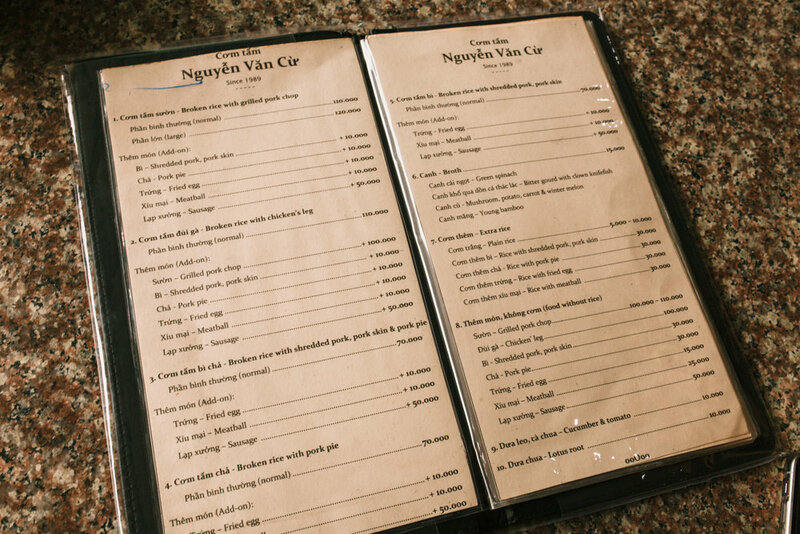 Behold.…my favorite meal in HCMC. This is probably my favorite because growing up my mom often served up this dish for breakfast. It’s quite a simple dish but I associate certain foods with happy memories so because this dish was significant in my childhood, eating it always makes me feel good. Food nostalgia at its finest. How do you eat it? 1. Pour a couple shakes of soy sauce onto the fried egg 2. Break the yolk. 3. Break the bread. 4. Spread pate onto bread 5. Use the bread to mop up yolk and pieces of egg. 6. Pair with the beefsteak. 7. Enjoy the experience. Seriously, so good. Having the right bread and pate is essential for this dish and this place had it down. The bread was served warm and was incredibly soft on the inside, making it easier to spread the creamy pate. People mistake this place for a steakhouse. It is NOT a steakhouse, do not expect quality steak, this is beefsteak. The cut is different so the meat is a bit tougher. We also ordered 3 of their freshly squeezed orange juices, EACH. It was that good. They call it the Orange Twister. It doesn’t taste the same as the fresh squeezed OJ from the U.S., if someone can tell me why Vietnamese cam ep is so different, I would LOVE to know. Anyway, don’t skip this spot! Pho Viet Nam. 66 Duong Tran Quoc Toan, P8, Q3, HCMC, Vietnam. Last but not least, we have the unofficial national dish of Vietnam, pho bo. Couldn’t leave for the airport without having one last bowl! What makes Pho Viet Nam different from the rest is clearly how it is served. The noodles are made in-house in an open kitchen where you can watch them make it. The Northern style pho is served in a hot stone bowl with all the major components on the side so that you can cook your noodles and meat to your liking. I love this idea because everybody wants their thinly sliced sirloin to be cooked a different way and now you have the option to prepare it how you like! The broth was clean, clear and aromatic. It had the perfect balance of sweet and salty, definitely a well made stock. Furthermore, the establishment was clean and had a bright ambiance to it. It was the ideal spot for a last meal and to wrap up our last day in HCMC! These were some of the places that made my short-lived trip in HCMC memorable. Hopefully, you’ll enjoy it as much as I did!